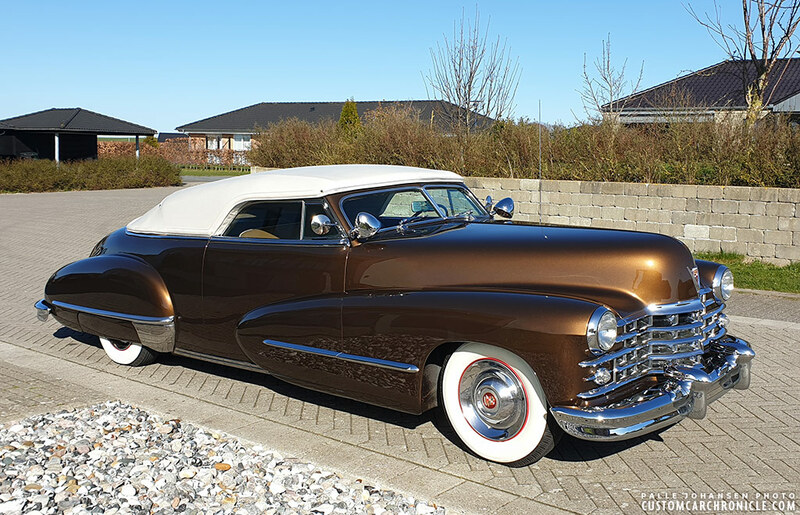 After many years in the works, Palle Johansens 1947 Cadillac Padded Topped Convertible Kustom is finally ready – enough – for its debut. 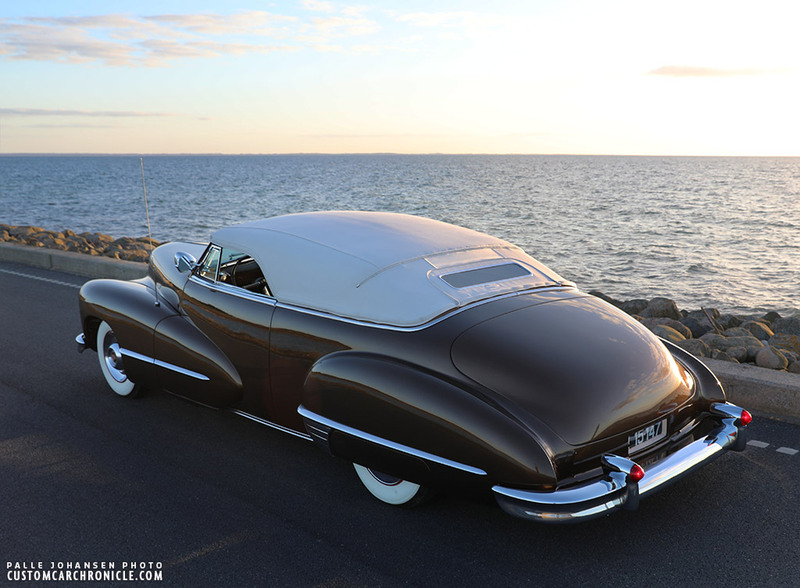 For the last few years Palle has been working on and off on his 1947 Cadillac Kustom. Adding all the details he has had in his mind for a long time. 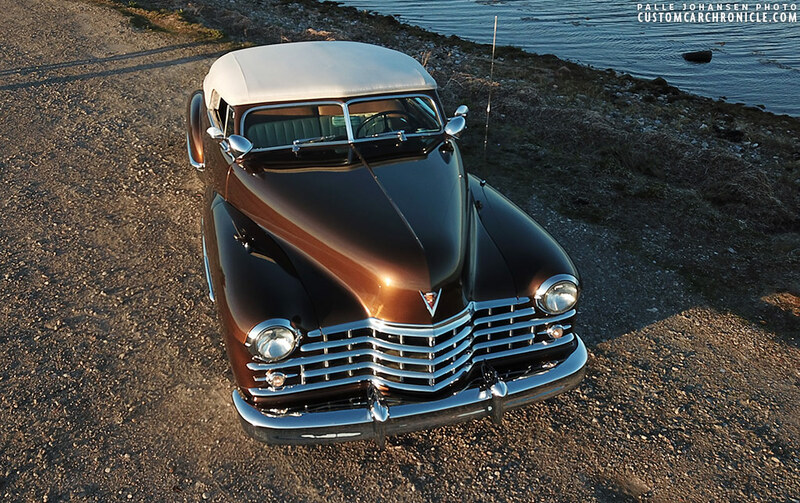 From the extended front fenders with home made brass side trim, the smoothed rear fenders, set in license plate, had made taillights set into 1949 Cadillac guards, to the beautiful styled dashboard with center mounted modified 1948 Cadillac Gauge panel. And not to forget the deep-dark-gold paint with added bronze powder, just as the masters in the 1940’s and 50’s used. 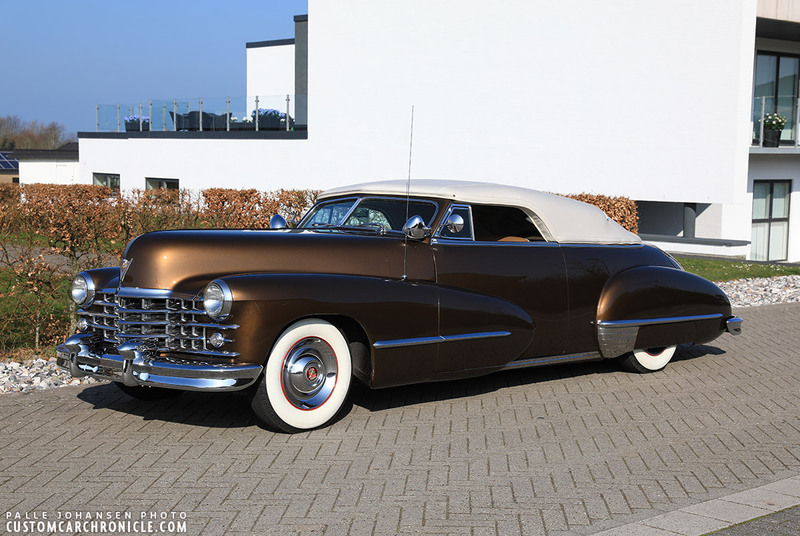 Palle’s goal with this Cadillac was to build the perfect 40’s Kustom, that could have been created in the late 1940’s. His main inspiration were the Custom Cars created by the Ayala’s, Barris and other So Cal builders from the late 1940’s. 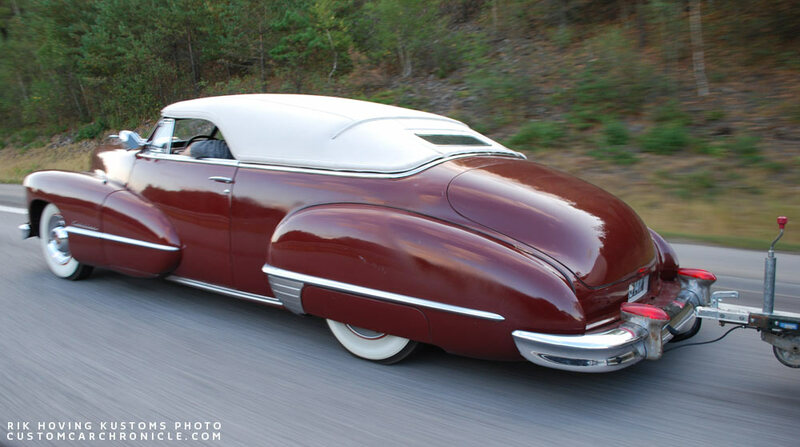 And especially the 1942 Cadillac Convertible Custom George Barris created for himself as personal driver. 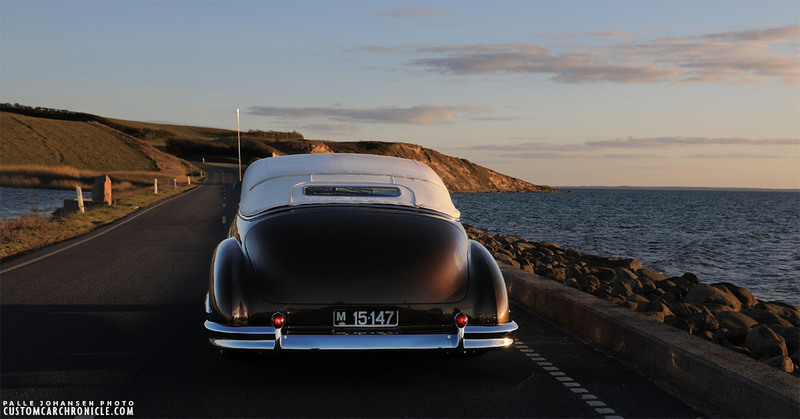 George used an older/cheaper ’42 model and updated it with ’47 fenders and bumpers. 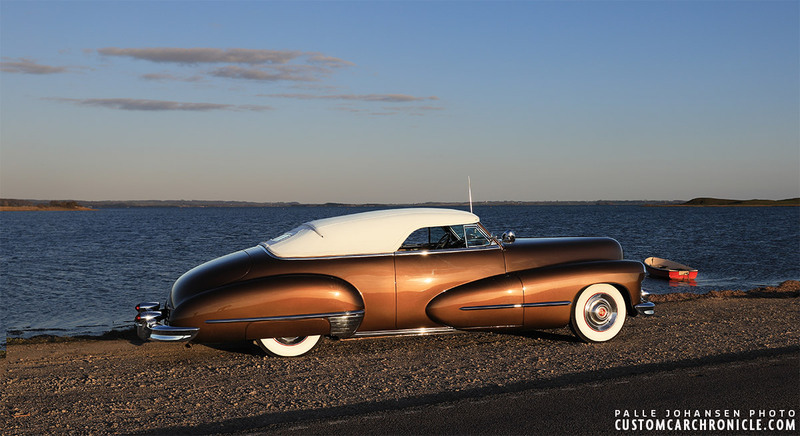 Barris had Bill Gaylord create the super long and perfectly shaped padded top. David Martinez recreated the top for Palle’s Cadillac in 2013. 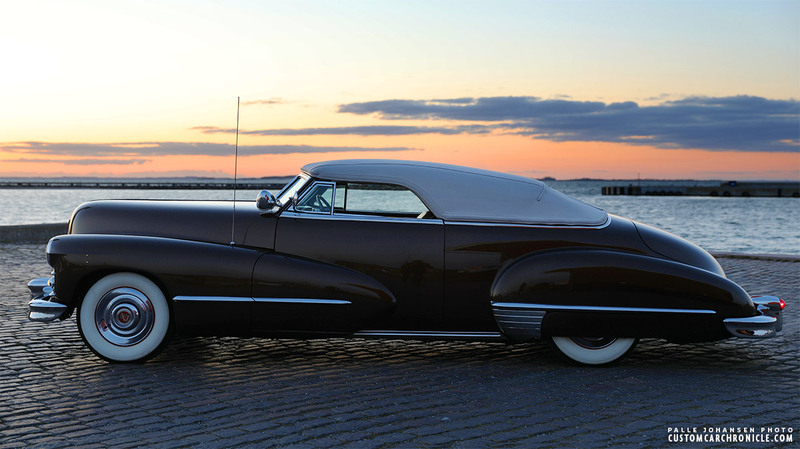 Inspiration for the Palle Johansen Cadillac is one that George Barris created for himself as personal driver in the late 1940’s. 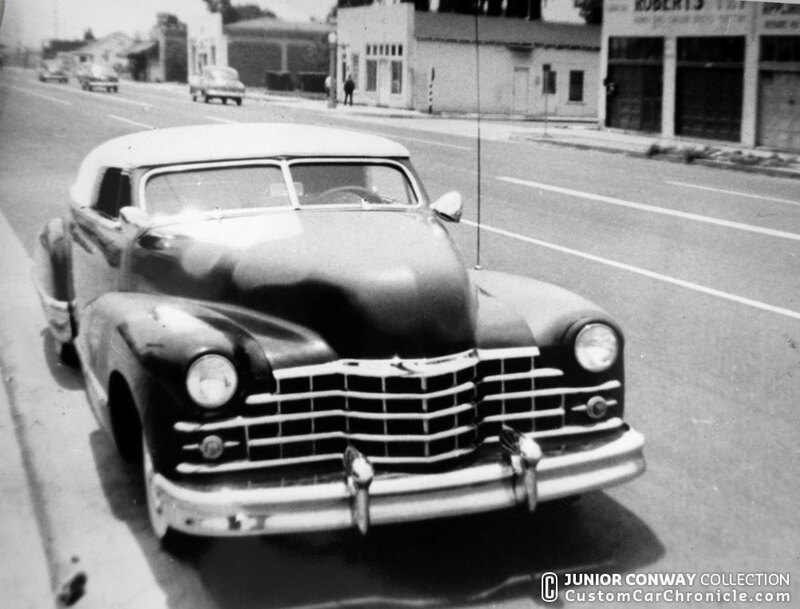 This Cadillac was updated from a 1942 model with new fenders, grille an bumpers. 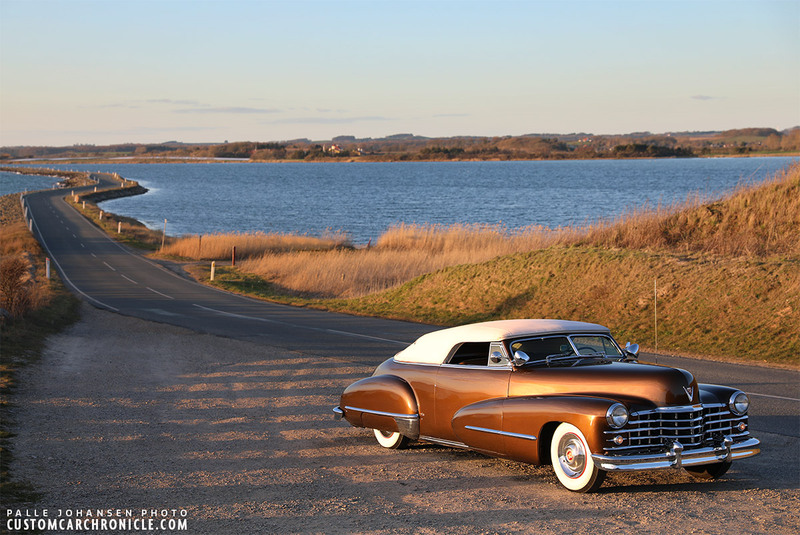 In 2014 Palle’s Cadillac was roughly finished, more like a driving project. Here seen on the road to the Old Style Weekend in Sweden. 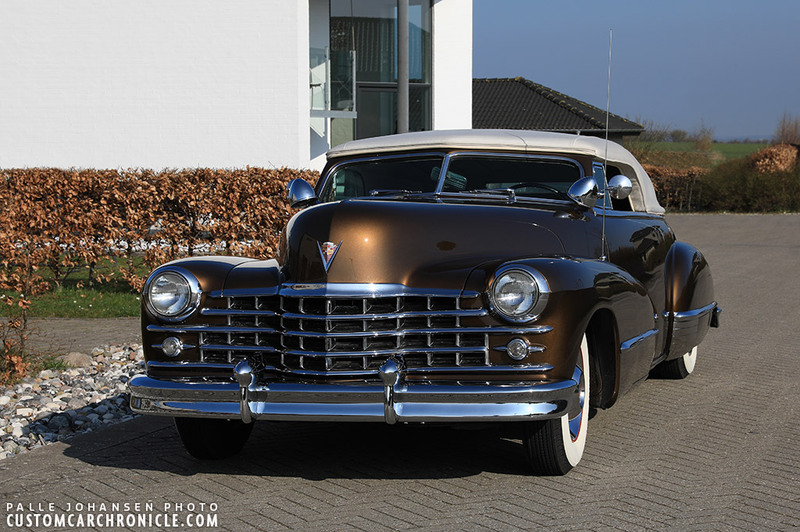 This is an introduction article celebrating that Palle’s Cadillac has been finished enough for its debut at the Flatlands Motorama in Rosmalen, the Netherlands on April 6-7, 2019. Special thanks to the team of friends who have helped Palle to get the car finished in time for the show. We will go much more in depth on the car, all the details and how it was created at a later date. For now, lets enjoy some of the photos Palle took last weekend. For the first time out with the padded top back on the car on Saturday March 30, 2019. 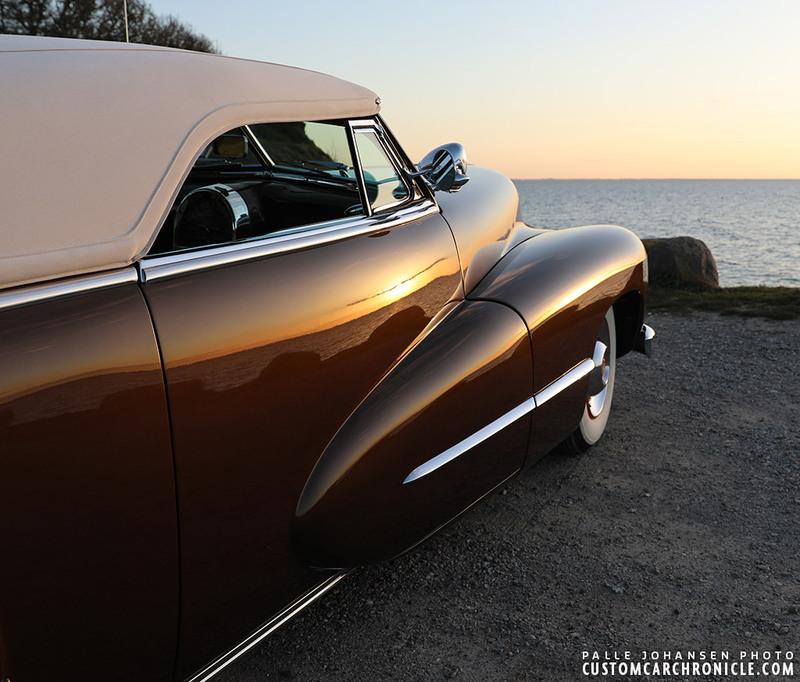 Kustom Car Perfection. The Dark Gold color was custom mixed with bronze powder added in the final coats. It looks really dark in the shadows, but ones the sun hits it it starts to glow and sparkle, and changes hues depending on the time of day. The extended and molded in front fenders flow harmoniously with the molded in rear fenders. The hood ornament end center trim was removed and the center peaked. Perfect side profile thanks to the extended cat-walk, heavily forward raked “B”-Pillar and flowing padded top. 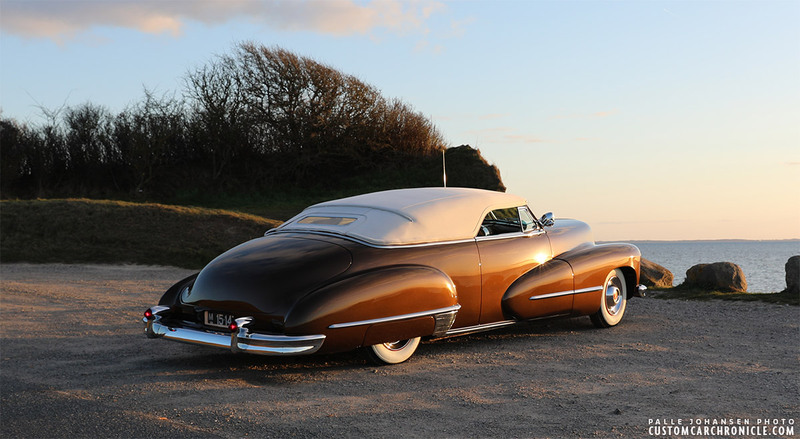 The Caddy…. and Palle are ready to Kustom Cruise this summer. The smaller size Danish license plates allowed the set in to be done below the truck. 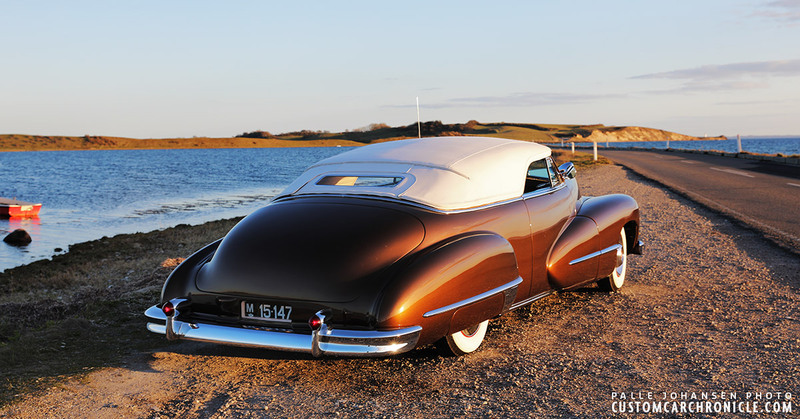 The taillights were home made to fit perfectly in the 1949 Cadillac bumper guards. 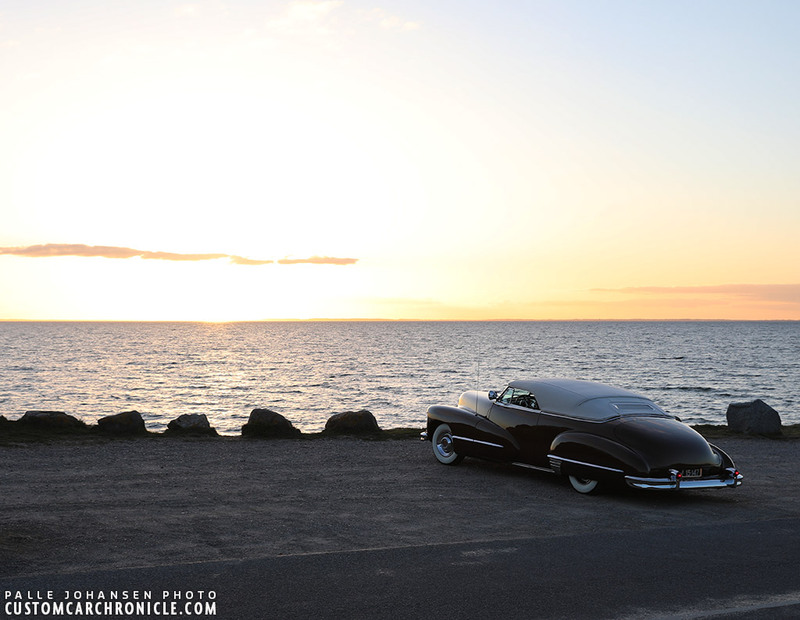 The ’49 guards are larger in size than the ’47 model, making them a better option for the taillights. The front fender section on the doors were extended to make the car appear longer, the side trim was hand made from brass. The vent windows were also completely made from brass after to many hours were spend trying to make the units to work with the lowered top. This photo shows a little bit of the center mounted ’48 Cadillac Gauge pod. The setting sun made the dark gold paint glow with a more red hue. A bit closer look at the custom mixed dark gold color with added bronze powder mixed in with the clear. Appleton Spotlights are mandatory on this style of Custom. 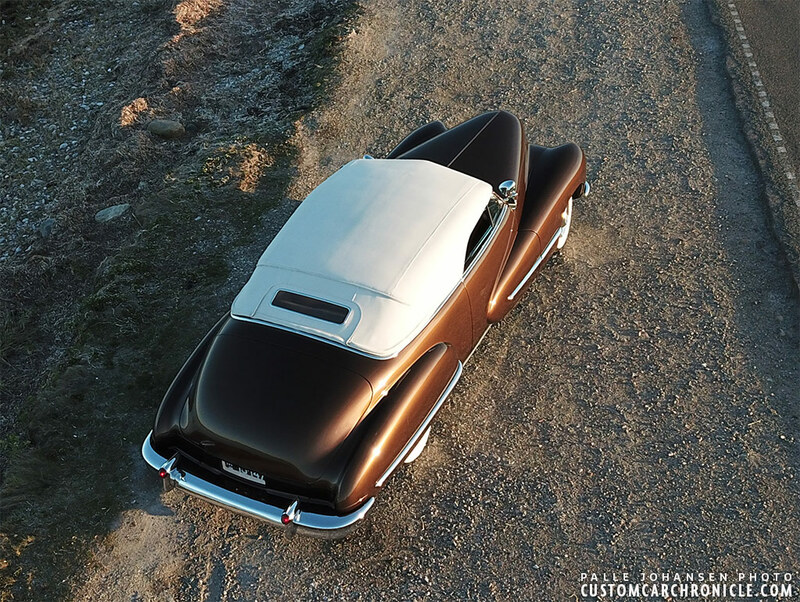 The goal was to create a period Custom Car that could have been built around 1949. 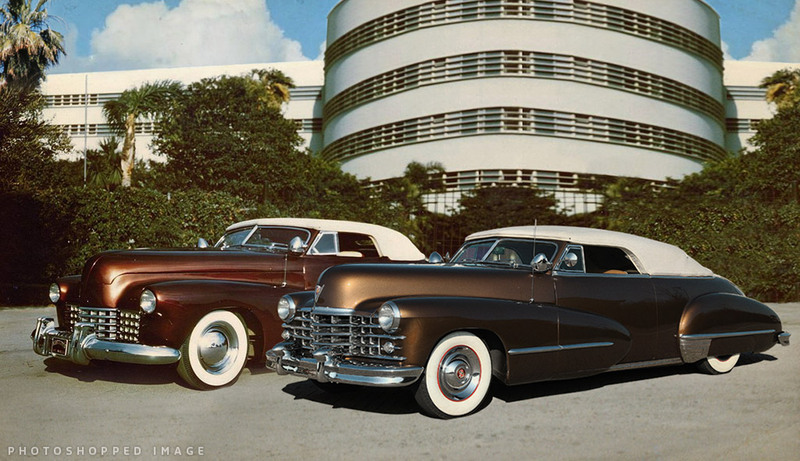 This Digital Restyled image shows Palle’s Cadillac parked next to George Barris his 1941 Buick photographed around 1948… Mission accomplished. 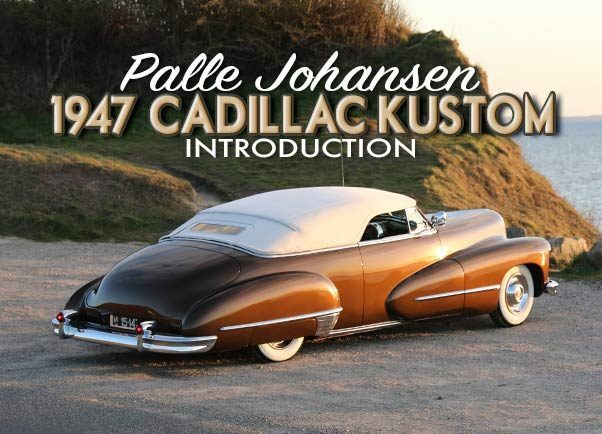 Stay tuned for articles on the Palle Johansen 1947 Kustom Padded Topped Cadillac in the near future. When we will share some more of the details, interior, dash, how it was created etc. But for now we hope you have enjoyed these debut photos. Breathtaking. 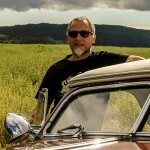 Thanks Palle and Rik for sharing, and for the forum articles which have let us share in your journey. Simply mindboggeling to see pictures of it , cant wait to see it in real life ! 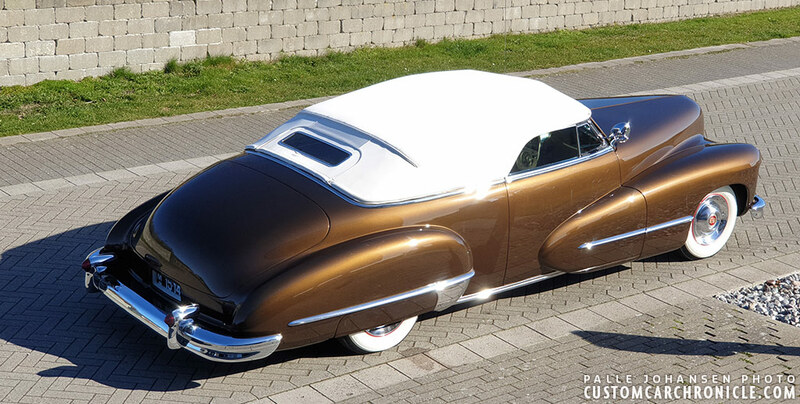 Teardrop streamline designed custom at its best , period perfect era custom , thanks Palle and all involved in creating this gem , you have set new standard for kustom custom car building ! Your friend in South Africa Carsten Lehn showed me some pictures. Just awesome Palle…..Who needs fancy HOT RODDERS JOURNAL when you have the C.C.C right…!! Palle I have this sneaky suspicion you some how found out a long time ago that the BARRIS Buick was painted in this brown / rootbeer brown kolor…..Long before the Kodak kolor surfaced here at the C.C.C ??? Would you please be kind enough to elaborate on this question please …..?? It killing me to know this answer…..! !